The Transport Canberra bus fleet is ageing. File photo. 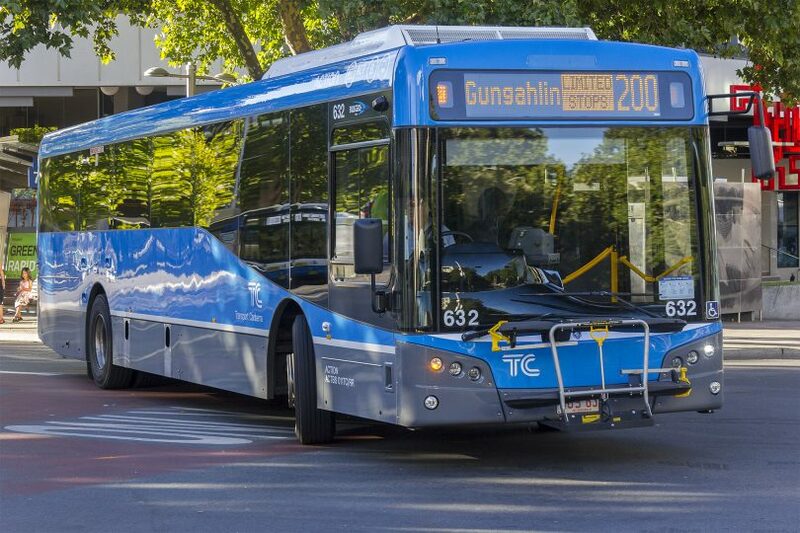 Transport Canberra is looking to acquire 40 zero-emissions buses as it moves to upgrade its ageing fleet and meet the ACT Government’s ambitious climate change targets. It is seeking expressions of interest from suppliers through a public tender, which says the agency would prefer zero-emissions buses – most likely electric but also hydrogen – over diesel ones, if they meet operational needs and are affordable. If not, Transport Canberra will consider buying, leasing, or an alternative arrangement. Such arrangements include potentially liaising with multiple providers, diesel or alternative low-emission buses, natural gas or hybrid, until zero-emission buses can be proven viable for the ACT transport network. It also wants to know how long it will be before zero-emission vehicles will be viable. The agency wants to time delivery of the new buses for the opening of the new Woden Bus Depot in early 2020, which it says offers an opportunity to integrate any required infrastructure into a new and centrally located depot. The new facility has been designed to allow retrofitting of supporting infrastructure if necessary. The tender documents say the current bus fleet is ageing and in need of modernisation, posing significant maintenance challenges. The current age of the fleet also means Transport Canberra needs to operate a very high number of spare vehicles to minimise the impacts of mechanical defects. The tender document says the buses, standard and articulated, must be designed for comfort, air-conditioned, meet disability requirements, able to be fitted with a bike rack and be able to run for 13 hours a day and up to 400km in range without the need to be recharged or refuelled. The ACT is on track to source 100 per cent of its electricity from renewables by 2020, and the Government has flagged the emissions-intensive transport sector for reform. The Government has a policy target for zero emissions for the ACT by 2045. “This will require a significant evolution of the transport sector,” the tender document says. April Littrell and double the labor cost, double the maintenance, 1.5 times the fuel cost and 1.5 the capital cost. And it worked so well when they introduced the smaller buses in the late 90’s. It is totally disingenuous to refer to electric busses as “emission free”. This can only happen when ALL electricity comes from renewable sources which is currently about only 15% of national power generation. Just because the government is committed to 100% renewables by 2020 doesn’t mean that they will always be able to source the power needed to fulfil the quota so coal power will still be needed for many years to come. The government would be better off if they powered the new diesel bus fleet with liquefied land fill gas which can be created from FREE methane at the MLRMC. Greg Williams as have other cities like Bangkok which make Canberra’s traffic problems look minuscule. The buses aren’t electric but have access to the centre of the road and passengers enter / exit from covered stations on the route. Why a tram? So much infrastructure. So much cost for same return. Glenn Kilpatrick except it isn’t the same return! That’s the whole point. I was told electric vehicles lack grunt and need a long electric cable to operate. Perhaps the doubters have not checked the real world. What was the result of the electric bus trial? Want to drive a Transport Canberra bus?